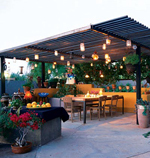 Below are 10 ideas that can help transform your backyard into an outdoor living oasis. Grilling – An American Classic. 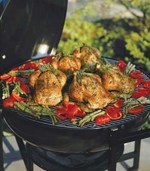 All it takes is a Weber charcoal grill and your favorite meat to create memories that will last forever. 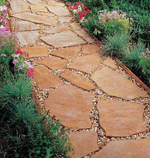 A Simple Flagstone Path – A mortarless flagstone path is a practically foolproof project. 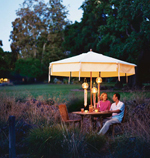 Party Umbrella – Dress up some lanterns with ribbon and add them to your favorite outdoor umbrella for a romantic night under the stars. 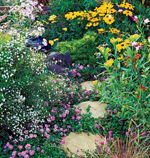 Butterfly Garden – Filling your garden with Nectar rich flowers brings Monarchs and other winged beauties to your garden on a regular basis. 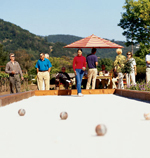 Bocce Ball – Creating after dinner fun is easy with the classic Roman game Bocce Ball. 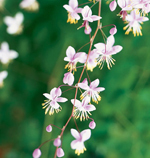 Easy Plants – Perennials can thrive for years in a single container. 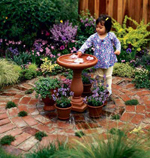 Have fun mixing and matching your favorite perennials around the yard for beauty that will last years to come. Decorative Pavers – Using just a few decorative pavers can bring life to that boring concrete patio. Keeping this small and simple is the key. 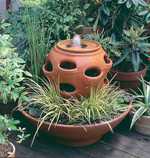 Fountains – Using small fountains around your landscape is a great way to add appealing textures and with moving water you don’t have to worry about pesky mosquitoes. 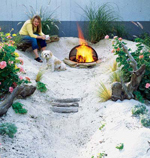 Build a Beach – Using sand from any hardware store and some creativity you can turn a small corner of your lawn into your own private beach oasis. Simple Lighting – Use mason jars and tea lights to create simple lighting around your lawn. It now only livens things up, it also gives a great natural glow to your property.